Find your voices, people. Design Manchester 18 has finally arrived and it’s all about speaking up, making statements and changing things for the better. Challenge accepted. Now in its sixth year, the Design Manchester festival has done some serious growing up. With over 40 events taking place city-wide, this year’s spectacle promises to be more outspoken, thought-provoking and revolutionary than ever before. And, as has become the tradition, the DBD team is here to walk you through all of this year’s crucial Design Manchester 2018 information, plus a few unmissable highlights in store for the city this year. When is Design Manchester 18? This year’s festival takes place from the 11th to the 21st of October, following more or less the exact same timing of the last few festivals. You’ve got to admire their consistency. The theme of DM18 is DISRUPT; challenging our city to speak up, speak out and do something a bit different. The organisers felt that now is high time for a shake up in this most special of cities, particularly in light of the rather sad-looking, mediated future we seem to be facing. Design Manchester 18 will hear from all the brightest and best creative disruptors from every conceivable field, all with the aim of encouraging us all to forge our own creative paths through the gloom. This year’s disruptive guestlist is brimming with fabulous folk with inspiring stories to tell. If you’re planning on dropping in on this year’s festival, keep an eye out for this incredible bunch. Kate Dawkins – Founder and Creative Director of Kate Dawkins Studio, London. 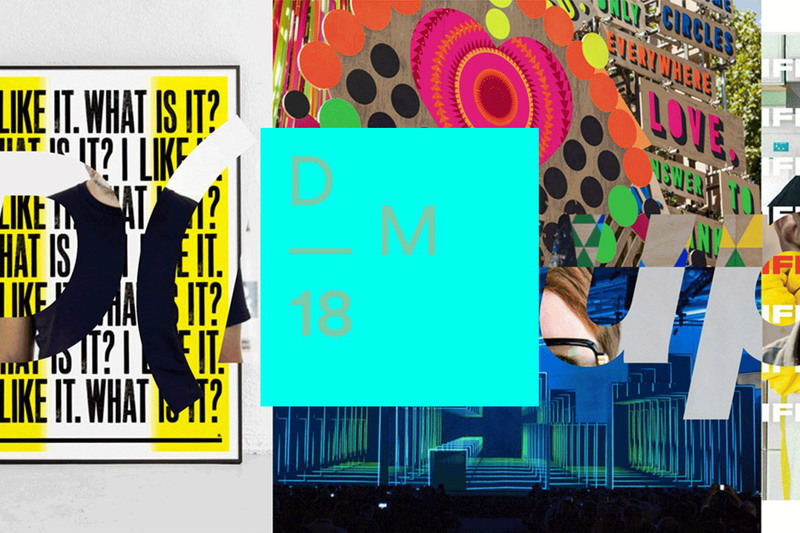 Most of these amazing creatives can be found making an appearance at the festival’s flagship event, the DM18 Conference, but check out the full list of DM18 artists for the full line-up and their whereabouts. If you’ve got something to say, here’s your chance to say it. This festival-wide, free event builds upon the festival’s theme of disruption and encourages the people of Manchester to make a statement. DM18 has collaborated with Berlin-based artist, Patrick Thomas, along with a few friends to create iconic stencils and slogans for everybody to use to create their own protests and speak up for their causes. So whatever you’re passionate about and whatever your age, head down to this event to create your very own messages and have fun expressing your opinions. For full details on this event, click here. We’ve all enjoyed having our colourful bee friends dotted all over the city over the last few months, but now the Bee in the City project is drawing to a close. On Friday the 12th to Sunday 14th the National Cycling Centre will allow Manchester’s passionate bee seekers to see all 101 bees together in one place for the final time, allowing us to say our final farewells before they are sold at auction. You can find out more about the event and buy tickets here. Bye, bees! You can’t let DM18 pass you by without visiting the Manchester Print Fair. One of our favourite events of the entire festival, the print fair brings together the city’s most talented printmakers for a celebration of pure creativity. Buy everything from posters and postcards to badges, gifts and clothing, all designed and hand printed by masters of this amazing artform. You’ll also find a variety of fun workshops to attend, including a 3-minute portraits session run by Manchester art store, Fred Aldous. Find more information on the Manchester Print Fair here. Each year the Design Manchester Film Season has a running theme, and this year the films all have the prefix: ‘Once Upon a Time’. All scheduled to be shown at Manchester’s most creative screening venue, HOME, the weekend of films kicks off with Sergio Leone’s widescreen epic, ‘Once Upon a Time in The West’, followed by the second film in Leone’s trilogy, ‘Once Upon a Time in The Revolution’. And to round off the weekend we’re being treated to a showing of ‘Once Upon a Time in Anatolia’, a co-winner of the 2011 Cannes Grand Prix. Find all the essential information including showing times over on the HOME website, and make sure you don’t miss the short introductions to each screening by DM18’s film series co-curator Malcolm Garrett. The Design Manchester festival has always been incredibly inclusive, with something to appeal to all ages and interests. This year sees the return of the DM CoderDojo, an exciting opportunity for our younger generations to get their teeth into challenging digital and coding projects. This is the 49th running of this highly popular event, and will feature special projects with the theme of ‘DISRUPT’ especially for this Design Manchester edition. The event is free for everybody, but you’ll need to grab yourselves tickets here. It wouldn’t be a highlights runthrough without mentioning the festival’s flagship event, the big conference. This year running under the appropriate name of D(isrupt)M, the Design Manchester conference is famously packed full of big creative names, interesting insights and lively debates. This year the conference has lined up the creative industry’s most disruptive influencers, including Morag Myerscough, Michael Wollf and Sir Terry Farrell, all prepared to share their big ideas and big statements. Tickets are now on sale here; don’t miss it! So rally your fellow creative troops and spread the word; it’s time to DISRUPT at this year’s extra vocal Design Manchester festival!